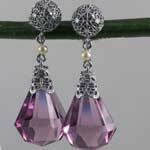 Fancy cut purple amethysts dangle from white gold filigree in these estate amethyst earrings. 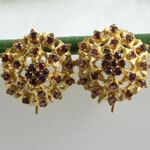 Gorgeous antique flower pierced garnet earrings in 14kt yellow gold stars. 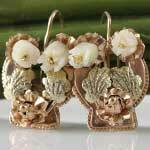 Lovely antique rose and yellow gold flower pierced earrings. 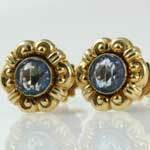 Antique Victorian black onyx mourning earrings in 14kt yellow gold with seed pearl accents. 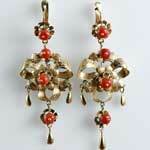 Beautiful antique Victorian orange coral pierced pendant earrings in 18kt yellow gold. 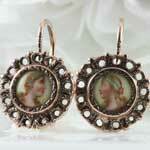 Antique portrait paintings on porcelain pendant earrings in gold 14kt ( 585 ). 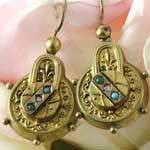 Antique Victorian turquoise diamond earrings in yellow gold. 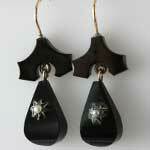 Absolutely stunning Art Deco 1920s Black Onyx Diamond pierced drop earrings in 18K gold. 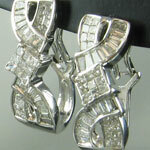 Incredibly gorgeous estate diamond earrings feature appx 2 ct tw of bright, fiery diamonds (2.00 ct tw, F-G, SI1-2). 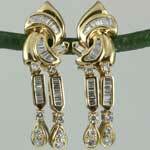 Sensuous estate diamond dangle earrings in a unique split leg design set in 18kt yellow gold (1.30ct tw, SI1, G-H). 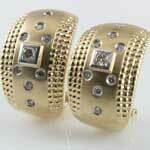 Eighteen shiny diamonds and rich yellow gold draw your attention to these estate diamond 14kt gold loop earrings.